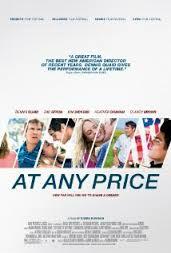 Dennis Quaid, Zac Efron, Kim Dickens, Red West, Clancy Brown, Maika Monroe, Heather Graham, Chelcie Ross. This is a film written and directed by Ramin Bahrani, born in North Carolina from an Iranian family background. He made quite some impact at an early age with some short films but features including Chop Shop, Man Push Cart, Goodbye Solo. And he was to further make his mark at festivals with 99 Homes. This is a particularly American story, the story of family. The father, a touch patriarchal, is played by Dennis Quaid, with Kim Dickens as his faithful wife, while he himself is not particularly faithful, having an affair with a woman in town, played by Heather Graham. He is involved in sales of machinery to farmers, with ups and downs in contracts and his continued need for finance, getting into trouble with rivals who bring in the law which threatens his livelihood and family. He had wanted his son to enter into the business but the son wants to be a racing driver. He is played by Zac Efron. The final crisis is played out in a way that audiences would not be expecting, the relationship between father and son, violence and cover-up. This leads to quite a deal of moral ambiguity throughout the film but, especially, in the finale and its repercussions for this. What might have seen quite a straightforward look at an American family in middle America, details of the way of life, and struggles within family, becomes a film of a different complexion. 1. The title? Expectations? Americana, families and traditions, business and success? Characters overreaching themselves? Paying the price? 2. Iowa, the farms in the fields, the roads? Offices, meetings? The racing car world? The cornfields? The songs, the school? 3. The prologue, the movies, the picture over the decades, the family, passing on traditions, hard work in the fields, success? The heritage? 4. The pressure on Henry, the influence of his father, his father’s hard work, expectations? Changes over the years? Different ways of work? Sales of seeds? Genetically Modified Crops? The customers, sales and reps? Henry and his children, hopes? His disappointment with Grant? His relationship with his wife, the comfort of the house, the many years? The reasons for his affair with Meredith? His washing the seeds, reselling them, his friend and the deal, his life and everything about to unravel? 5. Grant, the eldest son, studies, leaving home, going to Argentina, the mountain, climbing it, the clear air – and the postcards, letters? His achievement? Freedom? 6. The contrast with Dean, younger, his skill with cars, racing, awards? With Cadence and the friendship? The bond? Love or not? His antagonism towards his father? Going to the funeral, his father approaching the owner and talking about sales, Dean humiliated? The later recurrence of this theme, the deal, encountering the family who had rented the property and how they had lost their rights? Dean and love for his mother? His friends, the interest in cars, with them? The entry fee for the competition, his mother giving him the cheque, his father finding out? His father trying to support his son? The big drive, his nerves, the injury, the rivalry with Johnson’s son? His moods, changing, the encounter with Meredith, ousting Cadence? His adopting his father’s point of view, supporting his father, the fight with Johnson’s son, in the cornfields, his making assumptions about the critique of his father going to law, killing the boy, ringing his father, disposing of the body? Not telling anyone? the future? 7. Henry and his friend, his wanting a job, the past, washing the seeds and the machine, Henry refusing? The later meeting, the man giving information to the authorities? 8. The issue of washing seeds, rivalry and competition, Henry and his illegal dealings, the officials coming, getting them off his case, their persistence, his wife doing the books, his cooking the books? The discovery of who it was that reported him, going to meetings, memories of the funeral, the man and his wife, destitution, his agreeing to take the deal with Henry and to stay managing the property? Henry saving himself? 9. The Johnsons, the rivalry, sales in different counties, Johnson and his personality, his meeting with customers, the changing allegiance? Henry and his doing the same thing? The two sons and their car rivalry? The fight, the boy’s death? Henry and his double standards in offering consolation to Johnson? Johnson and his grief? 10. The parties with the customers, all cheerful, Dean and his joining his father? 11. The critique of aspects of the American dream?